While much of the publicity related to jobs and economic development is often centered on larger employers, the reality is that small businesses and entrepreneurs are critical to the economic success of any community or region. In the Upstate, many people are working to cultivate an entrepreneurial ecosystem that supports individuals and small businesses. Engaging the support providers for this key economic engine has been a focus of Ten at the Top and the Economic & Entrepreneurial Vitality Task Force since the early days of the organization. 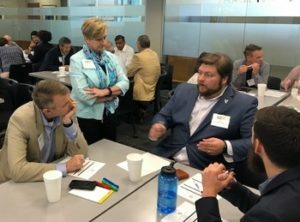 Over the last year, our Entrepreneur Support Providers Network has been hearing from local and national leaders on how to continue growing the entrepreneurial ecosystem in the Upstate. People, trust, values, culture. How do these attributes make our Upstate region entrepreneurs, founders and business owners more successful? entrepreneurial ecosystem development leader in the U.S., talked with our Entrepreneur Support Providers by Skype last November, this is what he said we needed. As you can imagine, our practical Upstate advisors, coaches, lenders, investors, SBDC & SCORE representatives, incubators, accelerators and every organization that supports entrepreneurs were a little uncomfortable with this. We were also a little uncomfortable with the region’s lack of awareness of the amazing work we do to build a thriving base of support for our entrepreneurs. As engagement with the Economic and Entrepreneurial Vitality driver area has grown, we knew we depend on our personal networks to match our entrepreneur clients to the appropriate network. Then we gathered professionals from around the 10 counties and realized there were many resources we didn’t know about that could be exceptionally helpful. The challenge became: How do we actively connect these new links to our network and provide appropriate resources for entrepreneurs? Stoll explained that entrepreneur ecosystems allow entrepreneurs to more quickly access the knowledge and funding they need, shortening their time to success and potential need for additional funds. To provide unobstructed pathways, we professionals need to know others in the network, understand the strengths and special skills each brings, take the time to connect entrepreneurs to the right person, and trust our peers. When I asked how to do this, he said one of the best ways is to do something together. What could we all do together, yet separately, to support our local entrepreneurs and increase awareness Our Entrepreneur Support Providers Network (soon to be Entrepreneur Ecosystem)? How about a regional Global Entrepreneurship Week celebration? That might work! In 2018, our ESP meetings have been geared toward individual events held within each community yet promoted collectively on shared platforms to shine a light on the extent of the many organizations involved in supporting entrepreneurs, founders and growing companies. Ten at the Top has a Regional Resource Map with Ecosystem members’ location and information easily accessible. In the Know Upstate is the regional calendar for the events. The Global Entrepreneurship Week and Ten at the Top brands on our materials will identify us as connected. REGISTER HERE for the upcoming Q3 Entrepreneur Support Providers Network Workshop on September 21st!